We mourn the loss of Jerry. He will be missed by those left here: wife Helen of 62 years, daughter Betsy and husband Bruce Freedman, son Jim and wife Lacy, daughter Sallie and husband Bill Cune, daughter-in-law Kim Hutchinson Faulstich, 15 grandchildren, and 7 great-grandchildren. He was predeceased by his daughter Peggy Faulstich Webber and son Dr. Mike Faulstich. Jerry was born and raised in Baltimore, MD graduating from Mount Saint Joseph High School. He joined the Army at 18 and served three years in the Army of Occupation in Germany after WWII. 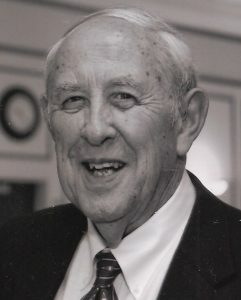 Following his service, he attended the University of Baltimore graduating in 1951 with a Bachelor of Science in Accounting. He joined the Hallmark Card Company in 1954 which promoted and moved him and his family to Charlotte, NC in 1967. He ultimately retired 1991 after a 37 year career with Hallmark. Upon retirement he and Helen began traveling the world. Some of the places he visited and loved to talk about include the Holy Land, Petra in Jordan, the Great Wall of China, the Berlin Wall (as it was coming down), and Antarctica. Through their travels they were able to visit all seven continents and sail most of the world’s seas. Jerry spent his life dedicated to his family. When they were young he supported his children’s education and many extracurricular interests such as Scouts, basketball, equestrian activities, music, gymnastics, and swimming to name a few. As they became adults he stayed involved where he could as a guide, facilitator, grandfather, and always a philosopher. Jerry also had a love of gardening. Over the years he could be found toiling in his yard on weekends when he wasn’t at his children’s activities. In just that respect his legacy lives in the form of azaleas, hydrangeas, cedars, crepe myrtles, and magnolias that still surround the houses where he has lived. There will be a Memorial Mass at Holy Spirit Catholic Church in Denver, NC November 10th, 2018 at 11AM. In lieu of flowers, donations are requested to be made to the Holy Spirit Catholic Church, Columbarium Building Fund at 537 N Highway 16, Denver, North Carolina 28037.